The program takes place in July each year. Participants travel through Beijing to a designated city in China where the language and cultural classes will take place. Later the teachers and students return to Beijing for sightseeing and to participate in a Closing Ceremony at the Hanban / Confucius Institute Headquarters. There they will also have the chance to meet the hundreds of other American students who were also participating in the China Bridge Summer Camp program before departing for home. Sponsored by the UCLA Confucius Institute, the Hanban Chinese Bridge Summer Camp for High School Students is a unique opportunity extended to about 200 students from across the United States. Anahuacalmecac International University Preparatory will culminate the rich international and academic experience our current ninth grade class has received with a delegation of students in the Hanban Chinese Bridge Summer Camp for High School Students. 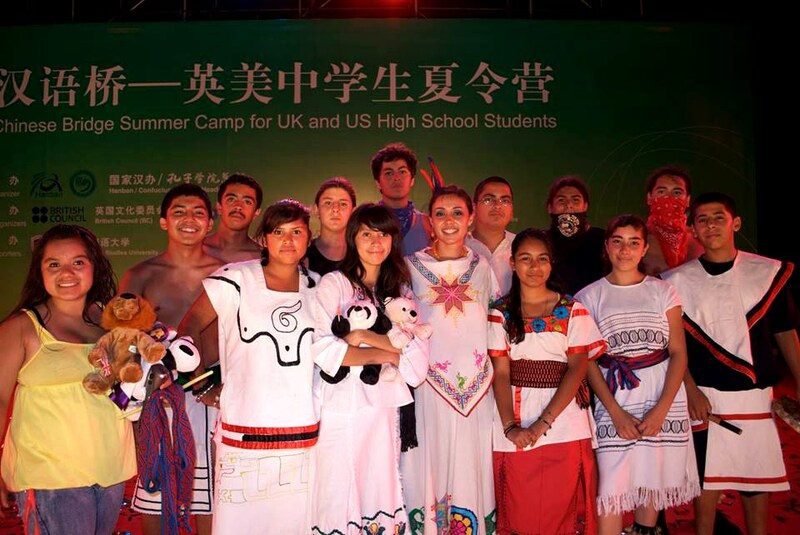 The Indigenous Student Delegation to China is a far-reaching project designed to enhance the academic experience our students have received for the last five years by creatively engaging their classroom experience in International education through an experiential process of long-term college-focused personal development. As Anahuacalmecac prepares our students for college and for entering the workforce, we want to be sure our students will be prepared to lead the workforce not simply fall in line. Our educational program roots traditional Indigenous pedagogy with the highly acclaimed International Baccalaureate Organization’s Primary and Middle Years Programs to prepare underserved students from historically discriminated communities for a university education and beyond. Students such as ours that can master the standard coursework in addition to English, Spanish, Nahuatl and Chinese are truly prepared to compete in the global market. Your support will enrich the educational experience of disadvantaged youth in East Los Angeles and help you meet your organization's goals of preparing undeserved students for a competitive workforce in the 21st century. If you can help our students raise funds to help make this Semillas Trip to China a reality, please visit our secure donation page and make a donation.